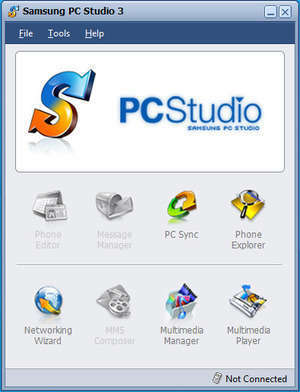 Samsung "Old PC Studio", or just Samsung PC Studio, is a Windows-based PC program that allows you to easily manage personal data and multimedia files by connecting a Samsung mobile phone (GSM only) to your PC. Version 3.2.3 is a freeware program which does not have restrictions and it's free so it doesn't cost anything. For security reasons, you should also check out the Samsung PC Studio download at LO4D.com which includes virus and malware tests. Additional screenshots of this application download may be available, too. Samsung PC Studio has a presence on social networks. Samsung PC Studio download been highly rated by our users.